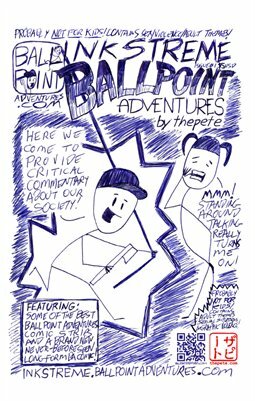 Ballpoint Adventures: Billy and Barbie know the main takeaway from last week. Well, the main 2 takeaways, really! Billy and Barbie know the main takeaway from last week. Well, the main 2 takeaways, really! Will MUELLER... PLEASE... SPILL THE BEANS!!! Soooo, drawing comics for free every week is actually hard work--throw me a couple bux on Patreon, wouldja? Thanks! Or just buy me a cuppa joe!